Schizophrenia is a mental health disorder wherein the patients are characterized by an abnormal perception of reality, abnormal thinking and sudden changes in the mood as well as behavior. The most prominent symptoms of Schizophrenia are hallucinations, delusion, difficulty in expressing emotions, difficulty in organizing speech and movements, difficulty in keeping up with the regular day to day activities, withdrawal from social interactions and a complete psychological change in the patient. The exact causes of Schizophrenia are not known yet. However, it is believed that genetic makeup and environmental factors such as malnutrition before birth, immense stress, immune system dysfunction could be among the potent factors to trigger the onset of the condition. These factors directly affect the dopamine and serotonin balance in the body. Since these two are the two main neurotransmitters in the body, a disruption in their secretion directly takes a toll on the neuron stimulation, which in turn affects the basic bodily coordination such as movements, thought patterns, memory and so on. 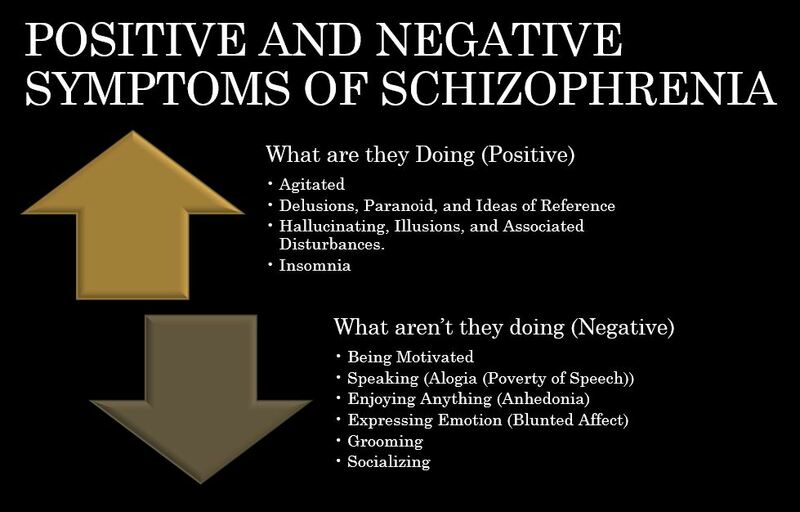 The symptoms of schizophrenia are classified as positive and negative. The positive symptoms include hallucinations and delusions which may not directly harm the affected person. These are caused by an over-stimulation of the nerves lying in the sub-cortical areas of the brain that are responsible for controlling emotion, attention sensation, movement, sleep and the likewise. Negative symptoms, on the other hand, are associated with a reduced drive for social activities and interactions. These are caused by a decrease in the signaling of the prefrontal cortex area of the brain, which is responsible for controlling activities such as decision making, personality, judgment, planning, social behavior, concentration and so on. Since schizophrenia could result out of a number of issues, the symptoms and the potential complications are not uniform among the different patients. However, if schizophrenia is left untreated for a sufficiently long period of time, it is very likely to affect every aspect of the individual’s life. The earliest issues include a marked deviation from the physical, emotional and behavioral patterns that are considered normal. The more severe issues include persistent depression, degradation of intelligence, effects on the social status, suicidal tendencies, various self-destructive behaviors and a long-term impact on the family members of the patient. A prompt and detailed treatment is needed for the person to jump back fully into a normal mental health. If the condition gets severe, it can permanently affect the brain, causing several irreparable damages. It has been studied that only 20% of the total number of patients are able to regain a normal mental health and happy lives. The rest usually suffer devastating and long-lasting effects, which does anything but keep them from leading a happy, normal life. However, in the recent past, a number of drugs have been developed, which are aimed at improving the lives of those patients who have not yet had a full recovery from the condition. Marijuana is often seen to have more positive impacts than negative ones when it comes to human health. It has also been used as a very effective treatment for various mental and physical issues for a very long time. Marijuana, along with other plants from the cannabinoids family is very rich in THC and CBD content. While THC is entirely a psychotic substance, CBD only initiates several reactions in the body without producing any psychotic effect. When compared to using cannabis, CBD oils have a highly reduced risk for THC side effects such as weight gain, increased prolactin levels, and movement disorder. It has been seen that CBD oils are most effective when used during the earlier stages of schizophrenia and other mental illnesses. The compound is associated with effectively managing the anxiolytic and antipsychotic effects associated with the condition. This is because CBD oils trigger an increase in the secretion of anandamide, which further goes and stops various dopamine-related activities in the body, thus neutralizing the increased secretion of dopamine. The other benefits of CBD oil are that it is highly tolerated by the body and therefore much safer as compared to most other anti-psychotic drugs. Although evidence only points towards the effectiveness of CBD in treating schizophrenia, researchers are still on their way and the compound will be put under various testing and clinical trials before it can finally be declared as an acceptable treatment for schizophrenia. How to use CBD oil For Schizophrenia? There are two ways of using CBD oil For Schizophrenia – vaping and capsules. Vaping ensures that the CBD is immediately absorbed by the body, thus providing quick results. It also does not produce thick clouds of smoke or leaves behind the annoying odor. However, if you do not want to go through the hassle of vaping, you can use oils for the same effect. Note: Nuleaf Naturals is what i like. For schizophrenia, patients are usually given 3 drops each, 3 times a day, once in the morning, once during the daytime and once during the evening. Here, the oil used is not entirely CBD oil, but rather a formulation that contains about 2 to 5 % of CBD, which accounts for about 3 to 10 mg of CBD per dosage. This, however, is just an example and the actual dose can vary from person to person depending on the severity of the condition and other individual medical needs. It is practical to start with a very small drop count and gradually increase or decrease the dosage depending on how your body reacts to it. CBD is currently seen as the most promising treatment for schizophrenia. It is very easy to administer and produces a very quick result. Using CBD oil For Schizophrenia has also been known to be more effective as compared to using other drugs. Furthermore, it does not leave behind any serious consequences or side effects. However, for the time being, it is still being studied extensively and only considered as an optional treatment.